Livestock ‘goods’ and ‘bads’: What are the published facts? 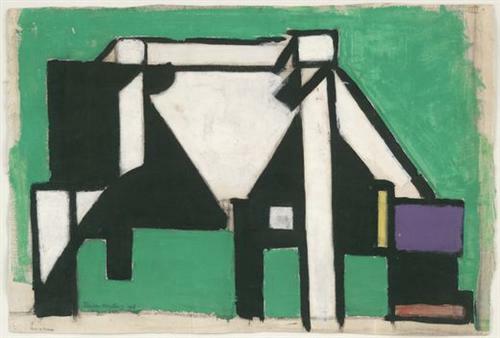 ‘Study for Composition VIII (The Cow)’, by Theo van Doesburg, c.1918, via WikiPaintings. Yesterday’s post on this ILRI News Blog, Livestock, poverty and the environment: A balancing act and a balanced account, highlighted the overviews and conclusions provided in a new science paper on the roles of livestock in developing countries. The paper, written by scientists at the International Livestock Research Institute (ILRI), also provides a wealth of research-based livestock facts little known (and less cited) in current global debates on the roles farm animals play in reducing or promoting global poverty, hunger, malnutrition, gender inequality, ill health, infectious disease and environmental harm. The authors of the paper argue that no single, or simple, way exists to view, approach or resolve issues at the interface of livestock and these big global problems. Consider the following facts / complicating factors cited in the new paper. Up to 1.3 billion people globally are employed in different livestock product value chains globally (Herrero et al. 2009). Milk and meat rank as some of the agricultural commodities with the highest gross value of production (VOP) in the developing world (FAOSTAT 2011). Nearly 1 billion people living on less than 2 dollars a day in South Asia and sub-Saharan Africa keep livestock (FAO 2009). More than 80% of poor Africans keep livestock and 40–66% of poor people in India and Bangladesh keep livestock (FAO 2009). Some 68% of households in the developing world earn income from livestock (Davis et al. 2007). Across the developing world, livestock contribute, on average, 33% of household income in mixed crop-livestock systems and 55% of pastoral incomes (Staal et al. 2009). The growth in demand for milk and meat, mainly driven by urban consumers in developing countries, has been increasing in the last few decades and is projected to double by 2050 (Delgado et al. 1999, Rosegrant et al. 2009). Livestock systems in developing countries now produce about 50% of the world’s beef, as well as 41% of our milk, 72% of our lamb, 59% of our pork and 53% of our poultry future (Herrero et al. 2009); all these shares are expected to increase in future (Bruinsma 2003, Rosegrant et al. 2009). Most meat and milk in the developing world comes from so-called ‘mixed’ crop-and-livestock systems [which] . . . are central to global food security, as they also produce close to 50% of the global cereal output (Herrero et al. 2009 and 2010). Food-borne disease is the world’s most common illness and is most commonly manifested as gastrointestinal disease; diarrhoea is one of the top three infectious diseases in most developing countries, killing an estimated 1.4 million children a year (Black et al. 2010). In countries where good data exist, zoonotic pathogens are among the most important causes of food-borne disease (Thorns 2000, Schlundt et al. 2004). Animal-source food is the most risky of food commodities (Lynch et al. 2006), with meat and milk providing excellent mediums for microbial growth. Most human diseases come from animals, with some 61% being ‘zoonotic’, or transmissible between animals and humans, including many of the most important causes of sickness and death. 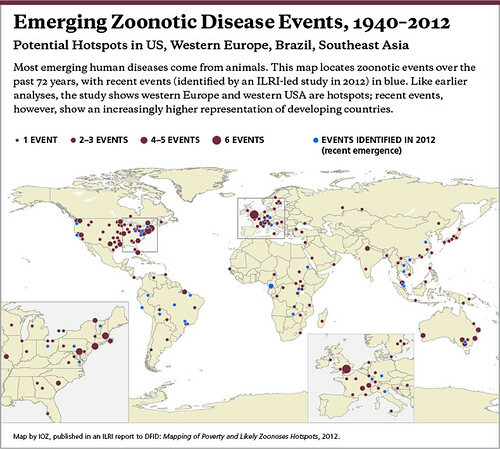 Endemic zoonoses that prevail in poor countries are among the most neglected diseases. Zoonoses (diseases transmissible between animals and man) and diseases recently emerged from animals (mostly human immunodeficiency virus [HIV]-acquired immunodeficiency syndrome) make up 25% of the infectious disease burden in the least developed countries (Gilbert et al. 2010). Currently, one new disease is emerging every four months, and 75% of these originate in animals (Jones et al. 2008). 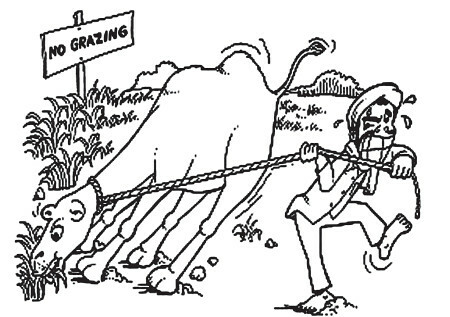 Land: For grazing or fodder? Livestock systems are one of the main users of land; livestock use some 3.4 billion ha for grazing and 0.5 million ha of cropland for the production of feeds (33% of arable land), globally (Steinfeld et al. 2006). Of the world’s 3.4 billion ha of grazing lands, 2.3 million ha (67%) are in the developing world, with expansion of pastureland at the expense of natural habitats in the developing world in the order of 330 million ha in the last 40 years (FAO 2009). The world will require an additional 450 million tonnes of grain to meet demand for animal products by 2050 (Rosegrant et al. 2009). Livestock are an important contributor to global greenhouse gas emissions causing global warming; current estimates range from 8.5% to 18% of global anthropogenic greenhouse gas emissions (O’Mara 2011), with the range reflecting methodological differences (inventories v. life cycle assessment), attribution of emissions to land use (Herrero et al. 2011, O’Mara 2011) and uncertainty in parameter values (FAO 2010). Livestock in the developing world contribute 50% to 65% of the total emissions from livestock in the world. (Herrero et al. 2013). The higher the productivity of farm animals, the lower the emissions per unit of their products (FAO 2010). While livestock systems in general terms generate significantly more greenhouse gas emissions per kilocalorie than crops, the potential for the livestock sector to mitigate such emissions is very large (1.74 Gt CO2-eq per year, Smith et al. 2007), with land-use management practices representing over 80% of this potential (Smith et al. 2007) and with most of the mitigation potential (70%) lying in the developing world (Smith et al. 2007). Livestock manure: Waste or resource? Livestock wastes—considered a serious problem in the developed world—are a critical agricultural resource in large parts of Africa, where soils are inherently poor (Petersen et al. 2007, Rufino et al. 2007). Manure contributes between 12% and 24% of the nitrogen input in nitrogen cycles in cropland in the developing world (Liu et al. 2010). Recycling of animal manures is practiced in most mixed crop-livestock systems, although efficiencies are rarely close to those of the developed world (Rufino et al. 2006). Synthetic fertilizers are unaffordable for most small-scale farmers, who depend on the (poor) fertility of their soils to produce food crops, or on livestock to concentrate nutrients from the relatively large grazing lands (Herrero et al. 2013). In many farming systems, the production of food crops directly relies on animal manures to increase effectiveness of fertilizers applied to cropland (Vanlauwe and Giller 2006). Although animal manure can be a very effective soil amendment, its availability at the farm level is often very limited, so designing technologies for soil fertility restoration only around the use of animal manure is unrealistic. Payments for environmental services: Exclude or include livestock keepers? Despite the fact that livestock is widely distributed in virtually all agro-ecosystems of the developing world, few ‘payment for environmental services’ schemes have targeted livestock keepers; most have focused on such services as climate, water and wildlife (Landell-Mills and Porras 2002, Wunder 2005). Enhancing the role that rangelands play in maintaining ecosystem services through improved rangeland management could be of essential importance for enhancing global green water cycles (Rockström et al. 2007). In Africa, where close to half of the pastoralists earn less than US$1/day, it’s estimated that even modest improvements in natural resource management in the drylands may yield gains of 0.5 t C/ha per year, which translates into US$50/year, bringing about a 14% increase in income for the pastoralist (Reid et al. 2004). 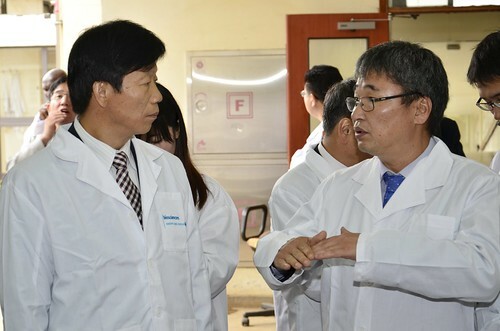 Scientific assessments needed by a global livestock sector facing increasingly hard trade-offs, 12 Jul 2013. This paper is an ILRI output of two CGIAR Research Programs: Livestock and Fish and Climate Change, Agriculture and Food Security. Territory size shows the proportion of worldwide meat consumption that occurs there (map by Worldmapper). Meat consumption per person is highest in Western Europe, with nine of the top ten meat-consuming populations living in Western Europe (the tenth in this ranking is New Zealand). The most meat is consumed in China, where a fifth of the world population lives. Authors of a new paper setting out the roles of livestock in developing countries argue that although providing a ‘balanced account’ of livestock’s roles entails something of a ‘balancing act’, we had better get on with it if we want to build global food, economic and environmental security. ‘The importance of this paper lies in providing a balanced account [for] . . . the often, ill-informed or generalized discussion on the . . . roles of livestock. Only by understanding the nuances in these roles will we be able to design more sustainable solutions for the sector. ‘We are at a moment in time where our actions could be decisive for the resilience of the world food system, the environment and a billion poor people in the developing world . . . . At the same time, . . . the demand for livestock products is increasing, . . . adding additional pressures on the world natural resources. 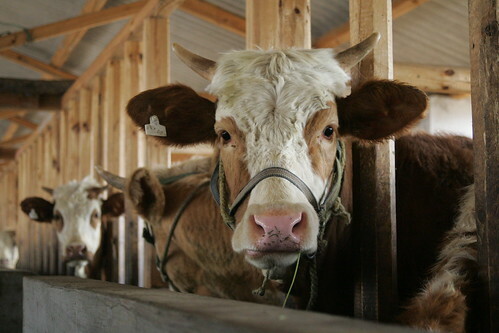 Not surprisingly, the world is asking a big question: what should we do about livestock? The paper, by scientists at the International Livestock Research Institute (ILRI), provides ‘a sophisticated and disaggregated answer’. The picture is complex. Whether for its positive or negative roles, livestock are in the spotlight. . . . [M]aking broad generalizations about the livestock sector [is] useless (and dangerous) for informing the current global debates on food security and the environment. So what are these ‘nuanced, scientifically informed messages about livestock’s roles’ that the authors say are essential? Well, here are a few, but it is recommended that interested readers read the paper itself to get a sense of the whole, complicated, picture. In a nutshell (taken from the paper’s conclusion), the authors say that ‘weighing the roles that livestock play in the developing world’ is a ‘complex balancing act’. On the one hand, we acknowledge that livestock is an important contributor to the economies of developing nations, to the incomes and livelihoods of millions of poor and vulnerable producers and consumers, and it is an important source of nourishment. On the other side of the equation, the sector [is a] . . . large user of land and water, [a] notorious GHG [greenhouse gas] emitter, a reservoir of disease, [and a] source of nutrients at times, polluter at others . . . . This paper argues that we will help ensure poor decision-making in the livestock sector if we do the following. ‘Formal and informal markets will need to ensure the supply of cheaper, locally produced, safe livestock products to adequately compete. This implies a significant reduction in transaction costs for the provision of inputs, increased resource use efficiencies, and very responsive, innovative and supporting institutions for the livestock sector in developing countries (FAO, 2009). ‘Underinvestment in extension systems and other support services has rendered poor producers disenfranchised to access support systems necessary for increasing productivity and efficiency’ or safety nets. Increased public investment in innovation and support platforms to link the poor, and especially women, to markets is essential. ‘. . . [S]tern public opinion in favour of protecting global environmental goods, instead of local livelihoods, could create an investment climate’ that hurts smallholder farmers. The informal and formal retail sectors must ‘gain consumers trust as safe providers of livestock products for urban and rural consumers’. The authors conclude their paper with a plea for greater tolerance for ambiguity and diversity rather than fixed ideas, and a greater appetite for accurate and location-specific information rather than simplistic generalities. Balancing the multiple roles of livestock in the developing world and contrasting them with those in the developed world is not simple. ‘The disaggregated evidence by region, species, production system, value chain, etc. needs to be generated. Messages need to be well distilled, backed by scientific evidence and well articulated to avoid making generalisations that more often than not confuse the picture and ill-inform policy. Livestock’s roles are simply not the same everywhere. The roles, whether good or bad, need to be accepted by the scientific community. The roles of livestock in developing countries, by ILRI authors Mario Herrero, Delia Grace, Jemimah Njuki, Nancy Johnson, Dolapo Enahoro, Silvi Silvestri and Mariana Rufino, Animal (2013), 7:s1, pp 3–18. Last month, we at the International Livestock Research Institute (ILRI) and within CGIAR and the wider agricultural development communities grieved over the sudden loss of American media guru Jeff Haskins, who had spent six years in Africa covering African agriculture news stories for the American PR firm Burness Communications. Haskins, who had just turned 32, died at the Kenya coast on 14 Jul 2012. 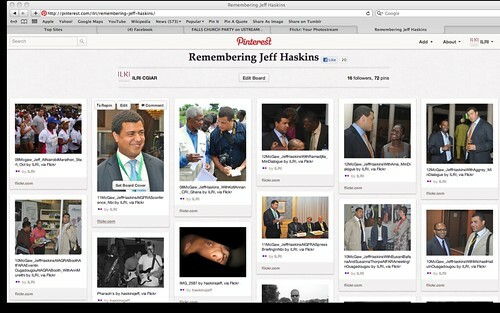 See online tributes to him from the ILRI News Blog (with links to 25 major news releases and 20 major opinion pieces that ILRI produced with the help of Jeff and his Burness team over the last five years), Pictures of Jeff Haskins (ILRI Pinterest Board), Pictures by Jeff Haskins (ILRI Pinterest Board), Burness Communications Blog, Global Crop Diversity Trust, CGIAR, International Center for Tropical Agriculture, La Vie Verte and Jeff Haskins Facebook page. Before his untimely death, Jeff Haskins in early Jul orchestrated major and widespread media coverage of a groundbreaking report by ILRI revealing a heavy burden of zoonoses, or human diseases transmitted from animals, facing one billion of the world’s poor. Some 60 per cent of all human diseases originate in animal populations. The ILRI study found five countries—Bangladesh, China, Ethiopia, India and Nigeria—to be hotspots of poverty and zoonoses. The study also found that northeastern United States, Western Europe (especially the United Kingdom), Brazil and parts of Southeast Asia may be hotspots of ‘emerging zoonoses’—those that are newly infecting humans, are newly virulent, or have newly become drug resistant. The study, Mapping of Poverty and Likely Zoonoses Hotspots, examined the likely impacts of livestock intensification and climate change on the 13 zoonotic diseases currently causing the greatest harm to the world’s poor. It was developed with support from the United Kingdom’s Department for International Development (DFID). An opinion piece by the main author of the study, ILRI veterinary epidemiologist Delia Grace, wearing her hat as a member of the Dynamic Drivers of Disease in Africa Consortium, appeared this Jul in The Guardian‘s Poverty Matters Blog. 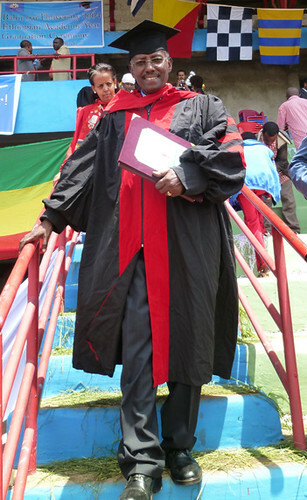 Azage Tegegne, of ILRI and the Improving Productivity and Market Success of Ethiopian Farmers (IPMS) project, was awarded an honorary doctorate of science degree by Ethiopia’s prestigious Bahir Dar University. ILRI bid goodbye to Bruce Scott, who served ILRI as a director for 13 years, the last decade as director of ILRI’s partnerships and communications department. Bruce is moving only down the road in Nairobi, from Kabete to Westlands, where he is taking up the position of deputy director of a new initiative of Columbia University (USA): Columbia Global Centers ⁄ Africa. We compiled links to ILRI inputs to the Rio+20 conference, including how to ‘turn straw into gold’ with dual-purpose crop residues and, with the International Center for Tropical Agriculture (CIAT), how livestock feed innovations can reduce poverty and livestock’s environmental ‘hoofprint’. ILRI produced a policy brief on ‘Preventing and controlling classical swine fever in northeast India‘. We film interviewed ILRI director general Jimmy Smith on ILRI’s evolving new livestock strategy and on ILRI’s role in providing evidence about the ‘bads’ as well as ‘goods’ of livestock production, marketing and consumption. And we interviewed ILRI scientist Joerg Jores on his research results, which, as reported in Scientific American, show that the pathogen that causes cattle pneumonia (CBPP) arose with domestication of ruminants ten thousand years ago, but only ‘heated up’ and began causing disease relatively recently. 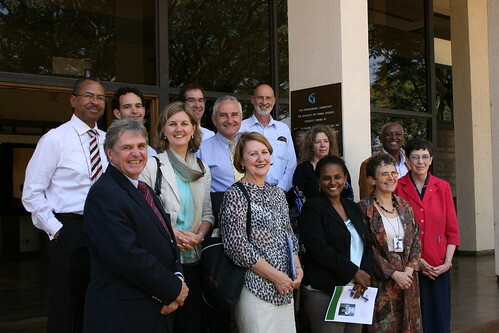 An Australian contingent visited ILRI this month and launched a new initiative, the Australian International Food Security Centre, to improve food security in Africa. The centre, which falls under the Australian Centre for International Agricultural Research (ACIAR), will spend USD33.8 million over four years to support food production in Africa as well as in Asia and the Pacific region. We reported on the signing of a memorandum of understanding by ILRI and Korea‘s Rural Development Authority (RDA) for laboratory work in Kenya, innovative platforms in an imGoats project in India and Mozambique, and training sessions on controlling zoonoses conducted by the Vietnamese members of an ILRI-led project known by its acronym EcoZD (‘Ecosystem Approaches to the Better Management of Zoonotic Emerging Infectious Diseases in Southeast Asia’). Azage Tegegne Livestock and irrigation value chains for Ethiopian smallholders (LIVES) project, Addis Ababa, Jun (256 views). 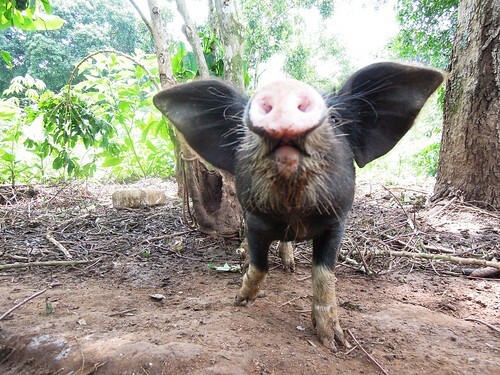 Danilo Pezo Smallholder pig value chain development in Uganda, Wakiso, Jun (1186 views). Derek Baker Livestock farming in developing countries: An essential resource, World Meat Congress, Paris, Jun (874 views). Derek Baker Interpreting trader networks as value chains: Experience with Business Development Services in smallholder dairy in Tanzania and Uganda, ILRI Nairobi, Jun (1879 views). Peter Ballantyne Open knowledge sharing to support learning in agricultural and livestock research for development projects, Addis Ababa, Jun (1589 views). John Lynam Applying a systems framework to research on African farming systems, CGIAR drylands workshop, Nairobi, Jun (1884 views). Bernard Bett Spatial-temporal analysis of the risk of Rift Valley fever in Kenya, European Geosciences Union Conference, Vienna, Apr (1164 views). Nancy Johnson The production and consumption of livestock products in developing countries: Issues facing the world’s poor, Farm Animal Integrated Research Conference, Washington DC, Mar (542 views). 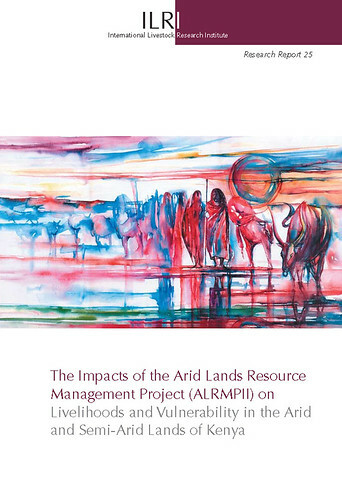 The cover of a 2011 ILRI report that evaluated a long-term drought management project–the Arid Lands Resource Management Project–in Kenya (photo credit: ILRI). The current drought in the Horn of Africa is once more stressing the urgent need to invest in agricultural development in the region. Adopting new approaches for drylands agriculture, increasing support for agricultural research and better cooperation between partners will help farmers and herders in these areas to cope with increasingly harsh climates and improve their food production. A 2011 report of an evaluation of a long-term drought management initiative in Kenya’s arid and semi-arid lands (ASALs) indicates that long-term interventions in Africa’s drylands can lower the levels of vulnerability to drought and reduce the need for food aid. Such initiatives help speed emergency responses, improve food security, empower locals to influence policies and promote often-neglected drylands issues at national levels. This review is of the second phase of a project known as ‘Impacts of the Arid Lands Resource Management Project (ALRMPII).’ It was carried out by the International Livestock Research Institute (ILRI) to assess the project’s impact on livelihoods and vulnerability in 10 arid and semi-arid districts in Kenya. The ALRMPII is a community-based drought management initiative that was implemented by the Government of Kenya with support from the World Bank in 28 districts. The first phase of this project concentrated on improving drought management, marketing, infrastructure and community development in 10 of Kenya’s arid districts over seven years (1996–2003). The project increased the response capacity of herders during the 1999 and 2001 droughts, implemented over 1000 micro projects that benefited over 180,000 people, created grazing reserves for pastoralists in 24 areas and supported initiatives to reduce land degradation. Following these successes, the project’s second phase or ALRMPII, started and was expanded to include semi-arid regions of the country with the aim of enhancing food security, increasing access to basic services, and reducing livelihood vulnerability in 28 drought-prone ASAL districts. This second phase of the project was carried out between 2003 and 2010. ILRI’s evaluation of ALRMPII reviewed activities in Garissa, Kajiado, Laikipia, Mandera, Marsabit, Mwingi, Narok, Nyeri, Tharaka and Turkana districts using household surveys, focus group discussions and interviews with relief and development agencies in the districts as well as people involved in policy processes in Nairobi. The review found that in arid areas, herders felt it ‘difficult to abandon pastoralism,’ which was the only suitable form of livelihood in these areas. In the semi-arid districts, on the other hand, communities were more likely to be settled because mixed crop-livestock farming was allowing them to diversify their livelihoods. As a result, many households in the semi-arid districts were increasingly relying on agriculture, and a growing cash economy enabled some herders to hire labour to manage their animals. The report, by ILRI’s Ayago Wambile and Nancy Johnson, interestingly found that while according to local indicators long-term interventions were effectively decreasing livestock losses in arid districts, food aid needs in those districts were increasing. The authors conjectured that increasing need for food aid could have resulted from prolonged dry seasons, which make it harder for households to re-build their herds and from increases in resource-based conflict. The report points out that although the arid areas had shown an increased demand for food aid, investment from Government through this project was lowering these needs. In the arid districts, ‘ALRMPII expenditure is negatively and significantly associated with the percent of people needing food aid,’ which means that as expenditure—a proxy for the intensity of project activity—increased the number of people needing aid declined. Also, the review suggests, the project bulletin had ‘become the most useful and most used source of early warning information for response agencies.’ Users of the bulletin also felt emergency responses were faster, better coordinated, and more appropriate, a claim that was supported by data on response times. The review shows that ALRMPII appears to have improved child nutrition and provided a ‘nutritional safety net’ in participating communities. Further, the project enabled local people to participate in policymaking. Key stakeholders from these regions were invited to take part in ASALs policymaking processes where they ‘contributed evidence and experience.’ (However, while access to social services did increase in the ALRMP study communities, this cannot be attributed to the project since it also increased in control communities). Finally, it recommends that future ALMPII reviews be expanded to cover impacts of the project on the environment, capacity building, community empowerment and overall risk management coordination in these regions. 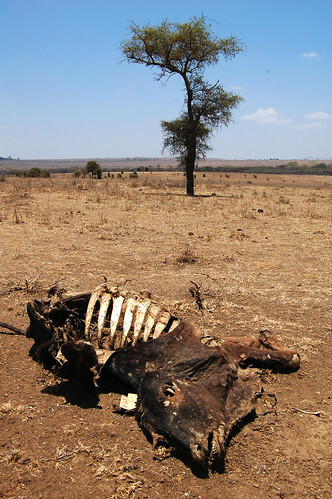 The carcass of a cow that died of starvation in the Kitengela rangelands, near Nairobi National Park, in the great drought of 2009 (photo on Flickr by Jeff Haskins). Those working to mitigate the impacts of the current drought in the Horn of Africa and to help prevent severe hunger and starvation from occurring here in future will profit from a close reading of a 2010 report by the International Livestock Research Institute (ILRI). This report—An Assessment of the Response to the 2008–2009 Drought in Kenya: A Report commissioned by the European Delegation to the Republic of Kenya—reviews the effectiveness of livestock-based drought response interventions during Kenya’s devastating 2008–2009 drought and suggests ways to improve the current drought management system and to incorporate climate change adaptation strategies into the country’s drought management policies. Without a single exception, all pastoralist groups interviewed consider mobility and access to natural resources as the most potent mechanism for coping with drought. Ironically, this is also the activity that is increasingly the most impeded. Interventions that facilitate and/or maintain critical migratory movement and/or allow access to unused grazing areas will continue to serve as the most powerful way to mitigate livestock losses during a drought. Often the funds required to achieve this are minimal compared to other interventions and as such it is also the most cost-effective intervention. Interventions targeting the removal of restrictions to mobility and access should be considered as prime activities during preparedness. Participants of a one-day workshop on commercial destocking in Marsabit District said that a successful commercial de-stocking intervention is next to impossible if the district does not already have a functioning, fully fledged, dynamic livestock trade as an ongoing activity during ‘normal’ times. ‘Emergency’ commercial de-stocking, they said, should in that case not be necessary because the commercial sector, if functioning, should be capable to up-scale its activity if and when there appeared a drought-related market surplus of stock. Although the drought responses presented here appear to be more effective and timely than responses to earlier droughts, these recent responses are not keeping up with an ongoing decline in many pastoral households in livestock assets and coping capacities. Furthermore, poor governance, lack of political will and mismanagement of funds plague efforts to move from relief responses to longer term development interventions. And conflicts over land, closely linked to a rapid population growth in Kenya, remain largely unresolved, with indications that these conflicts are only increasing and severely restricting pastoral mobility. Local communities were not involved in the design and implementation of most interventions to help them cope with the drought. The single community to be consulted was in Laikipia, and that consultation was restricted to just one topic: livestock off-take. A Kajiado Naserian community that wanted support with finding alternative livelihoods so that it could stop relying on relief food actually found a goat distribution project that involved the community to be more successful than any relief interventions. Another community, in Isiolo’s Merti location, prefers a viable livestock market to any government-funded livestock off-take program and sees investments in pasture management as one way to solve the feed problems during drought. Increased semi-permanent presence of key non-governmental organizations in critical areas that are able to encompass a realistic drought management cycle approach has substantially improved information and speed of response. This, in combination with improved collaboration between agencies, together with improved coordination has at face value improved both the quality and timeliness of responses to droughts. The continued implementation of a basket of suitable preparedness activities remains the most cost-effective approach to reduce the impact of shocks. Activities such as those implemented by a regional ‘Drought Preparedness’ program of the European Commission’s Humanitarian Aid department (ECHO) and a project on ‘Enhanced Livelihoods in the Mandera Triangle’ funded by the United States Agency for International Development (USAID) are beginning to show a marked impact. But this good news is largely negated by other factors, such as reduced line ministry capacity, administrative/institutional changes such as the relentless creation of new districts, and conflicts. In some arid districts and in overall humanitarian terms, drought emergencies are no longer caused solely by prolonged periods of rainfall deficit; rather, such emergencies are increasingly provoked by many factors acting in concert, with the most important contributing factor being reduced access to high-potential grazing lands. This situation is itself caused, and heavily exacerbated, by a relentlessly increasing demographic pressure that is creating whole populations with scarce access to any animal resources at all. These dryland communities are left highly vulnerable to shocks. • The problems underlying dryland livestock-based livelihoods cannot be solved by relief interventions alone; their solutions require long-term research and development strategies and programs that build on and strengthen rather than undermine local institution, livelihood strategies and coping strategies. • Population growth and the continued and unplanned creation of settlements without access to permanent water continue to put a huge burden on humanitarian sources during a drought. • Communities found corruption and mismanagement to be bigger problems than ineffective interventions. • A Livestock Emergency Guidelines and Standards (LEGS, 2009) handbook, summarizing livestock-specific interventions, is an excellent toolkit supporting relief practitioners, but much remains to be improved regarding the appropriate timing of such interventions. • The lack of a coordinated approach in, and access to, reliable livestock statistics, both numerical and distribution wise, remains a huge constraint in the overall management of Kenya’s arid and semi-arid lands. • To prevent delays in the release of emergency funds, drought contingency plans should be regularly updated and contain agreed-upon quantitative triggers for the release of funds to implement interventions and creation of a sufficiently endowed national drought contingency fund deserves the highest priority. In late 2009, at the conclusion of Kenya’s 2008–2009 drought, the European Union delegation funded this review of responses to the drought to help Kenya improve its drought management system by recommending more appropriate, effective and timely livestock-based interventions. The report begins by characterizing the severity of the two-year drought and assessing how well its impacts were forecasted. It then reviews 474 livestock-based interventions carried out during the 2008–2009 drought in six arid and semi-arid districts in Kenya. It recommends which livestock-related interventions to implement during drought (including specific advice on commercial destocking) and provides a checklist of advised livestock-based interventions for different scenarios. It offers guidelines for effective monitoring and evaluation. And it identifies where the drought response intervention cycle is hampered by policy constraints and how these might be addressed. Drought is the prime recurrent natural disaster in Kenya. It affects 10 million, mostly livestock-dependent, people in the country’s arid and semi-arid lands; remarkably, these non-arable lands cover more than 80 per cent of the country’s land mass. 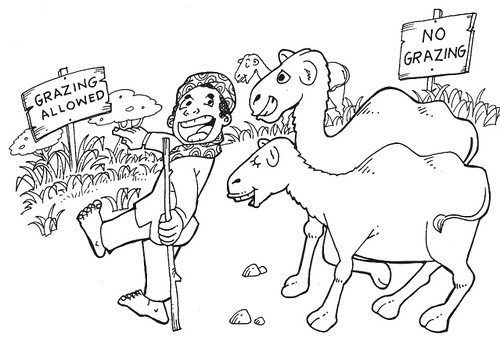 While reducing the country’s economic performance, recurring droughts particularly erode the assets of the poor, who herd cattle, camels, sheep, goats over the more marginal drylands. This regular erosion of animal assets is undermining the livelihoods of Kenya’s pastoral herding communities, provoking many households into a downward spiral of chronic hunger and severe poverty. Since 1996, the Office of the President in Kenya, supported by the World Bank, has been implementing an Arid Lands Resource Management Project (ALRMP) in the country’s drought-prone and marginalized communities. The ALRMP, further supported by the European Union, funded a Drought Management Initiative and consolidated a national drought management system with structures at the national (Kenya Food Security Meeting, Kenya Food Security Steering Group), district (District Steering Group) and community levels. This drought management system includes policies and strategies, an early warning system, a funded contingency plan and an overall drought coordination and response structure. The main stakeholders involved, in addition to the Government of Kenya and its line ministries, are various development partners and non-governmental organizations. The most far-reaching changes to Kenya’s drought management system since its inception are now under way and include major institutional changes through the creation of a Drought Management Authority and a National Drought Contingency Fund. Chapter 3 provides a general characterization of Kenya’s 2008/2009 drought. Chapter 4, assesses the drought responses in six arid and semi-arid districts of Kenya (Kajiado, Isiolo, Samburu, Laikipia, Turkana and Marsabit), incorporating feedback from a variety of stakeholders at district and national levels. Chapter 5 provides a checklist for drought-response scenarios; Chapter 6, guidelines for monitoring and evaluating responses to drought; and Chapter 7, a plan for commercial destocking in one of these districts. Chapter 8 summarizes climate change forecasts for Kenya and assesses the need for incorporating climate change adaptation policies into the country’s drought management strategies. Chapter 9 discusses the implications of the findings and makes recommendations. Chapter 10 distils lessons learned. This report is similar to an evaluation of responses to the 2000/2001 drought in Kenya (by Y Aklilu and M Wekesa) and reviews to what extent their recommendations were effectively implemented. The number of livestock interventions made increased dramatically between the 2000/2001 and 2008/2009 droughts. The total expenditure was also greater in 2008/2009 (USD4.6 million for 6 districts) than in 2000/20001 (USD4 million in 10 districts). 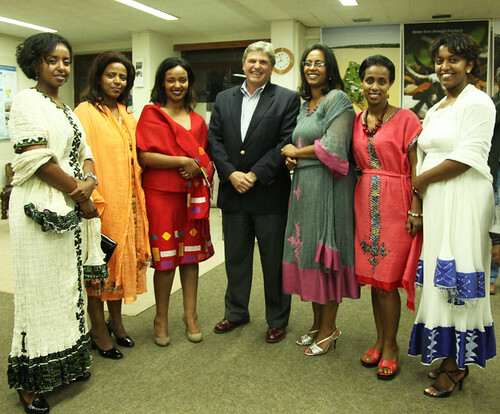 ALRMP and the Kenya Government were the main funders of the efforts. Unfortunately, most livestock-related interventions began very late, in early to mid 2009, well past the optimal timing closer to the onset of the drought, in mid-2008. The ALRMP interventions started earliest, reportedly because it was the only organization with funds readily available through its Drought Contingency mode, when the drought became apparent to all. A total of more than 1.5 million people benefited directly from the interventions made in 2008/2009. The cost per individual reached was Kshs3,362, ranging from Kshs163 for water trucking to Kshs8,652 for emergency destocking. An estimated 15,873 tropical livestock units were purchased as part of emergency off-take. Over 5.7 million animals were reached by health interventions between July 2008 and December 2009. Over 1.5 million people were reached by interventions, 413,802 with traditional livestock interventions (destocking, animal health and feeds). The most effective interventions were those that facilitated access to under-utilized grazing and watering resources. Those districts in Kenya with little new access to these natural resources are the most vulnerable. So-called ‘commercial de-stocking’ remains the least cost-effective drought intervention in Kenya. Long distances to markets, poor timing of interventions and lack of economies of scale all play important roles in making this kind of de-stocking unviable. But more than anything else, lack of an existing dynamic marketing system virtually precludes a commercial de-stocking operation from being cost-effective. ‘Livestock-fodder-aid’ comes a close second in terms of poor cost-effectiveness. Shipping substantial quantities of bulky commodities such as hay to remote locations is extremely costly and moreover has had little if any measurable impact. Slaughter off-take, preferably carried out on the spot, with the meat distributed rapidly to needy families, is a popular intervention with beneficiaries and can provide substantial benefits. Those that sell a live animal often benefit also from the distribution of its meat. And the availability of this high-protein food can benefit household nutrition while allowing the selling households to maintain a little purchasing power a little longer. • The number of livestock-related interventions and the funding associated with these both increased considerably over the interventions carried out during the last drought in Kenya, in 2000/2001. • Once established, risk management systems tend to become static, but effective risk-management systems need to be adaptive and to build in mechanisms for people to ‘learn’. • Few interventions were made by mid-2008, when the drought was already apparent. Early interventions are preferable as they are more effective. Yet 63 per cent of all interventions, and all destocking programs, were conducted after June 2009, when the drought was at its peak. • Unmanaged resource-related conflicts among ethnic groups were reported to be a major constraint to an equitable use of the diminishing natural resource base. • Bringing in water with tankers, maintaining and developing boreholes and destocking by slaughter in the affected areas were generally considered to be the most effective interventions. Most ‘other water’ and animal feeding interventions were considered ineffective. • The problems of many unsuccessful interventions, such as animal feed and health, were due largely to inefficiency of implementation and/or poor timing. • A third more animals were moved in 2008/2009 than in 2000/2001. As disease killed many of the animals that migrated, animal health interventions should be included in future migration strategies. • Hay provisioning, which when well done might be an appropriate intervention, was generally too late and too little to have any significant impact on supporting animal herds through the drought. • Apart from Turkana and Samburu districts, no information on livestock marketing was disseminated or off-take exercises publicized, resulting in late off-takes and a greater expenditure of resources for off-take during the emergency stage than during the alert/alarm stage. • Bulletins put out by EWS (Early Warning Systems) provide overly generalized information, with no specific livestock focus, making the information inappropriate for livestock interventions. The information also often appears late, is too generic for district-specific interventions, and defines no thresholds for the release of contingency funds. • A lack of publicly available near-real-time and historic rainfall data hampered the real time analysis of rainfall anomalies. From a timeliness perspective, rainfall data is the most appropriate source of information for early warning, as it allows the longest response time to scale up relief operations. A number of organizational issues in the hands of government could improve this situation. • Analysis of monthly vegetation greenness anomalies does not appropriately reveal rangeland drought conditions relevant for livestock, as livestock manages to cope with shorter periods of reduced forage availability. A twelve-month running average of NDVI (normalized difference vegetation index) detected historic droughts much more precisely, indicating the usefulness of running average techniques for rangeland early warning purposes. • Satellite imagery allows near real time to screen opportunities for migration and identify for remedial conflict resolution in areas of high insecurity. • The reporting on livestock body condition, milk production and productivity proved to be inconsistent across districts, frequently incomplete and with units of measurement unspecified, indicating the need to harmonize the collection of livestock statistics. Read ILRI’s whole report: An assessment of the response to the 2008–2009 drought in Kenya: A report to the European Union Delegation to the Republic of Kenya, 2010, by Lammert Zwaagstra, Zahra Sharif, Ayago Wambile, Jan de Leeuw, Mohamed Said, Nancy Johnson, Jemimah Njuki, Polly Ericksen and Mario Herrero. Read an earlier ILRI News blog on this report: Livestock-based research recommendations for better managing drought in Kenya, 18 Jul 2011. Three other recent ILRI research reports, published since that above, also assess the effectiveness of past drought interventions in Kenya’s northern drylands and offer tools for better management of the region’s drought cycles. (2) The impacts of the Arid Lands Resource Management Project (ALRMPII) on livelihoods and vulnerability in the arid and semi-arid lands of Kenya. ILRI Research Report 25, 2011, edited by Nancy Johnson and Ayago Wambile. This study assesses the impacts of the Arid Lands Resource Management Project (ALRMPII), a community-based drought management initiative implemented in 28 arid and semi-arid districts in Kenya from 2003 to 2010 to improve the effectiveness of emergency drought response while at the same time reducing vulnerability, empowering local communities, and raising the profile of ASALs in national policies and institutions. (3) Livestock drought management tool. Final report for a project submitted by ILRI to the FAO Sub-Regional Emergency and Rehabilitation Officer for East and Central Africa, 10 Dec 2010, by Polly Ericksen, Jan de Leeuw and Carlos Quiros. In August 2010, the Food and Agriculture Organization (FAO) sub-Regional Emergency Office for Eastern and Central Africa contracted ILRI to develop a prototype livestock drought management decision support tool for use by a range of emergency and relief planners and practitioners throughout the region. The tool, which is still conceptual rather than operational, links the concepts of ‘drought cycle management’ with best practice in livestock-related interventions throughout all phases of a drought, from normal through the alert and emergency stages to recovery. The tool uses data to indicate the severity of the drought (hazard) and the ability of livestock to survive the drought (sensitivity). The hazard data has currently been parameterized for Kenya, but can be used in any countries of East and Central Africa. The tool still lacks good-quality data for sensitivity and requires pilot testing in a few local areas before it can be rolled out.